PROVERBS 16:7 KJV "When a man's ways please the LORD, he maketh even his enemies to be at peace with him." 4The LORD hath made all things for himself: yea, even the wicked for the day of evil. 5Every one that is proud in heart is an abomination to the LORD: though hand join in hand, he shall not be unpunished. 6By mercy and truth iniquity is purged: and by the fear of the LORD men depart from evil. 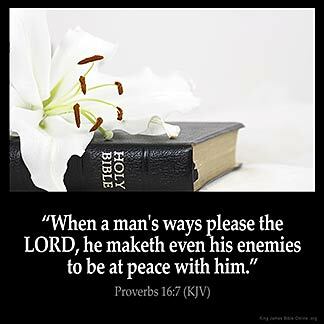 7When a man's ways please the LORD, he maketh even his enemies to be at peace with him. 8Better is a little with righteousness than great revenues without right. 9A man's heart deviseth his way: but the LORD directeth his steps. 10A divine sentence is in the lips of the king: his mouth transgresseth not in judgment. When a mans wayes please the Lord, he maketh euen his enemies to be at peace with him. Jesus pleased His Father : Jesus is my example : Our Father God was and is pleased with Jesus. Even so : when I walk in God 's commandments I am pleasing my Father. The enemy cannot come into the camp. The Spirit of the Lord has lifted up a standard against him. My enemies are at peace with me. Christopher Olusesi Okuselu: you asked how to overcome the devil 's temptations. The best way to overcome the devil is to stop sinning. And the only way to not sin is to walk in the Spirit. Call on the name of the Lord Jesus and ask Him to cleanse your heart and to baptize you with the Holy Ghost. We can 't serve God and the devil too. Hope this helps. Serve God, obey him and deviate from sin.Don 't retaliate your enemies, greet and show love to them.They must surely come back to you and bless you and become your friends and helpers.I am a living testimony.Praise the LORD. When you serve God in truth and in spirit,you build your faith in Jesus Christ and you obey God 's commandments and flee from sins.The way is Jesus Christ.The Bible says that Jesus Christ is the way, the trurth and the Life that no one comes to the Father except through Him.John 14:6.How is your way in Jesus?....Make your way perfect in Jesus Christ. really when god pleases with you,i am always dreaming about god,in so many ways,and am always victorious in all my enconters with the evil doers,i no god loves me,and even if I offend god,am always eager to go back to him,no matter the deceives from te devils and his agent,i will proclaim the name of the most high the greatest of all names,the alpha and the omega,and his name will reign from generations to generation,and his kingdom will have no end,realy want to work for him,he always visits me all the time,i want to work for him all the time,i want to be an instrument of the most high God almighty,to him all honour and adorations,and all the nations shall worship him and proclaim his glorious deeds and works in all the nations,am always been arrested by gods spirit when ever the devil comes,he his so great,please all I need is an advice on how to always overcome the devils temptations and his tricky ways of deceiving gods chosen people,i don 't want to be amonge the people that wilol make heaven,cos I believe heaven is real.thanks and god bless,ame.